I finally have my cruising budget built up to where I can at last have some new sails made, and have long yearned for non-white sails, particularly something in a nice royal/pure blue. Alas, according to all the lofts I've been talking to, it seems that colored Dacron is only available these days in fairly light weights, 4oz being the heaviest I've found. I was actually hoping for some beefy 10oz offshore cruising sails, but am wondering whether it's madness to simply layer up two sheets of 4oz blue Dacron, sewn together into what would roughly equate to an 8oz sail. Or must I be doomed to have pathetically boring white sails on my boat...? Plied cloths are often used in sail construction, usually to add extra reinforcement to highly stressed areas (like the leech), so what you suggest is not impossible. However, to design a sail completely around two layers of light dacron is likely to handicap the sailmaker, especially considering that such light cloth is not likely to be the best weave for the usage. satisfaction? Anyway, I would be asking this question of your chosen sailmaker rather than here on CF where you will get opinions from less knowledgeable folks (like me)! It is possible to use either ink or paint to color white Dacron. This commonly done on storm jibs (orange) and putting sponsor logos on sails (some of those are vinyl). It's typically done on a laminator type machine (a bath and then heated rollers to set the color). So, if you really wanted to, you could organize this, and it would be better than a two-ply sail. But if you are not stuck on blue, you can get 'tanbark' sailcloth in many weights, which are not boring white. And you can also get international orange in different weights. Canvas can be plied. Vide sail corners. But this is not not common for the panels. Sail made out of 2x4oz layers will not have the strength and resilience of one 8 oz layer. Ask your sailmaker who will probably list to you all the possible cons. Another option would be to have the sail coloured after being built - vide adds on racing sails. Thanks for the suggestions about dying, painting, vinyl , etc. but I'd want a solution that would have more longevity than such options offer, and if I can't get it, then I'd just go for white. Tanbark is another option, yes, but while I like the look of tanbark sails on an old wooden boat, they seem to me (just a personal opinion) to look odd on a plastic boat, however classic it might be. But that's just me. In the heavier weights you may be limited to tanbark, storm orange and cream. Cream can look fantastic! Get a sample and see if you like it. Or get a laminate sail that use a thin dacron taffeta for protection. The taffeta could possibly be dyed. Rolly Tasker FTW! I'll be getting my blue sails! We have plenty of 3.8 oz dark or light blue (and cream for that matter). We could twin ply all your sails using 3.8 oz. This means we double each sail and sew them together. We had a client who worked for the United Nations who was a geologist who visited our sail loft who insisted we make all his sails twin ply. They were white dacron and a different weight to the ones I am suggesting above because it was a much larger boat than your ketch. I asked him what his reasoning was. He said that he was taking the boat to the Antartic for a year and bitter experience had taught him it was better to have two sails sewn together rather than one only as there was nowhere to take sails for repairs and maintenance. He also said that when repairs were necessary you were faced with repairing only one of the sides only as a rule. Appearance wise it is impossible to see that two sails are sewn together. If we twin ply all your sails together you will achieve the blue colour you want, additional rugged strength and by and large they should be about the right weights for the boat. Dimension Polyant do a 5oz blue (light blue or royal blue options)which would be good. 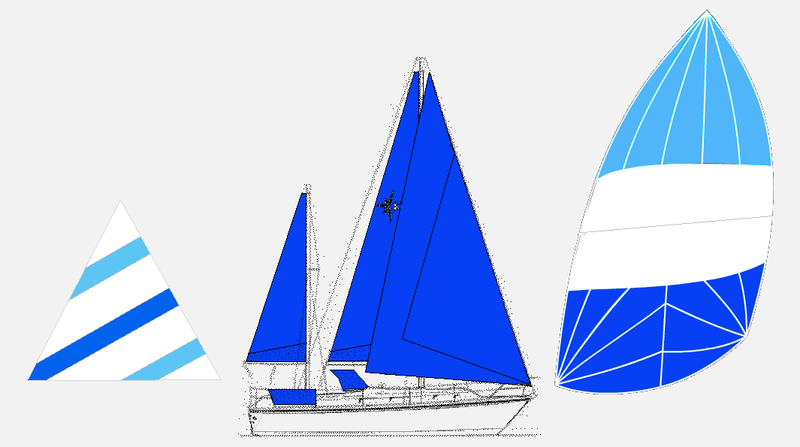 It would still use a 60% 2 ply mainsail and a 40% 2 ply back section and foot on headails (high load areas), this would be fine. it is a significantly more stable cloth than the various 3-4oz colours around, but a bit more pricey. We have done a Roller furling genoa on a 40' cruiser who wanted a blue and white alternating panels sail along these lines. It was fine. Well, these will be for offshore use, so 5oz would be way too light. I was shopping in the 9-10 oz range, but the combined 7.6oz two ply with extra reinforcement should be fine. Sorry you have misunderstood me. The sails would be made from a 5oz base with a 2 ply layer in the high load areas. It is a fairly common application and stronger and lighter than a sail made completely from 2 plys of lighter cloth. Here is an article by Brian Hancock which explains it well. We used to make a lot of these prior to the development of laminate sailcloth. I have used it in applications like yours where a particular look is required. We were once asked to quote on a whole set for an 84' ketch in bright orange for the Sydney Hobart Race! Two words. Resale Value. I really think that anything that is outside the norm can often devalue a boat. White sails are pretty much the accepted norm. Even if somewhat boring. Unless it enhances the characteristics of the boat, I would leave them white. Thanks. That may be valid and wise advice for alot of folks. But my boat is my home and I intend to be on it longer than these sails will last, so resale value is not relevant for me.